Let me tell you about the problem I have with God's love. I know He loves me, but I always find myself a bit baffled about the location of that love. Life is one big story. I know that God loves me in my big overarching story. Skimming through the chapters in my life I sense His love & purpose for me. I see His faithfulness at all the big mile markers. I get God's love on the 'macro' level. The dilemma I find myself in is this: The story of my life is a culmination of ordinary days. Emotional days when I act like a 12 year old who didn't make the cheer squad. Days when I do what I know I shouldn't do. Fantastic moments when I say something that sounds more profound than it actual is. Days when I manipulate because I don't think God knows what He is doing. Days when I don't like what God is doing. Days when I do better than I ever imagined I could do. We live in days. Some are great & others are very unimpressive. Too often I find myself just trying to get past the days to the big themes of the story. I saw this verse a few weeks ago & it has become a sort of mantra for me. "Be HERE..." Here in the awkward moment. Here in the boring moment. Here in the small victory. 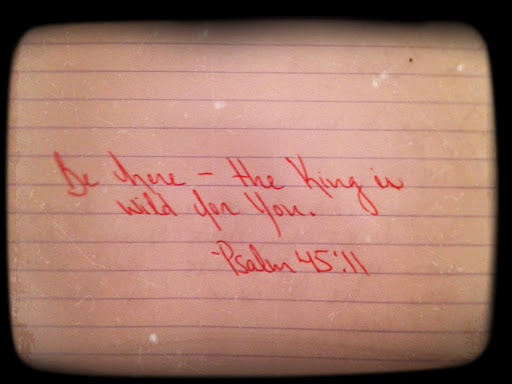 "...the King is wild for you." He doesn't just love me. He is wild for me. I need to stop trying to get to the next place & the next day. He is wild for me right where I am. God's love isn't just some big & ambiguous 'everywhere'. It is here. It is today. And it is wild.